SPRINGFIELD, IL (May 28, 2012) - Harley-Davidson Screamin’ Eagle Factory Team rider Kenny Coolbeth finished sixth as the AMA Pro Harley-Davidson Insurance Grand National Championship opened its Grand National Twins season on the Springfield Mile at the Illinois State Fairground. Coolbeth was the top qualifier for the event and ran as high as second place before falling back in the closing laps. The race was won by Harley-Davidson of Wausau/Independence Harley-Davidson rider Willie McCoy, who was riding a Harley-Davidson XR750 motorcycle. Coolbeth won his qualifying heat and recorded the quickest lap time of the session to gain the pole position for the 25-lap National. He finished fifth in the four-lap Dash for Cash bonus sprint, which was won by Howerton Motorsports/Eaken Racing Kawasaki rider Bryan Smith. Coolbeth got a bad start when the flag dropped for the first time, but the race was stopped before the first lap was completed for a four-rider crash in the first turn. Southeast Harley-Davidson rider Sammy Halbert, Global Products rider Nichole Cheza and Memphis Shades rider Robert Pearson did not make the re-start. Coolbeth left the line well on the second start and opened the race in sixth place as Zanotti Racing/Schaeffer’s H-D rider Jake Johnson, Scott’s Powersports rider Johnny Lewis, and Rogers Racing/Blue Springs Harley-Davidson rider Jared Mees took the early lead. Coolbeth worked up to fourth place on lap five, about a half-second behind the leaders, and passed Lewis to move into third behind Smith and Johnson on lap 11. That trio led the pack for seven laps, with less than 0.025 second between them, until Coolbeth got by Johnson on lap 18. With the race winding down, Coolbeth was well positioned behind the leader Smith in a pack with McCoy, Johnson, Lewis and Mees, but on lap 22 Coolbeth dropped back to fourth place. Then on the last lap, the pack bottled up behind Smith, and Coolbeth slipped out of the racing groove, was passed by Mees and Lewis, and finished 1.834 seconds behind the winner. Later on the last lap, McCoy managed to pass Smith, who had led 15 consecutive laps, to take his second consecutive win at the Springfield Mile. For McCoy, who also won last September, it was his second Grand National victory in a 24-year career. Johnson was second, just 0.017-second behind McCoy. Smith finished third, followed by Mees and Lewis. 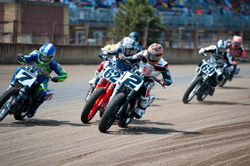 Coolbeth leaves Springfield in fifth place in the AMA Pro Harley-Davidson Insurance Grand National Championship combined standings, which includes points from three previous Grand National Singles events. Mees leads the standings with 78 points, followed by GCR /White’s Harley-Davidson rider Matt Weidman with 64 points. Lewis and Johnson are tied with 63 points, followed by Coolbeth with 56 points, Halbert with 52 and Smith with 51. The next race on the Grand National Twins schedule is June 30 on the Allen County Fairgrounds half-mile near Lima, Ohio.